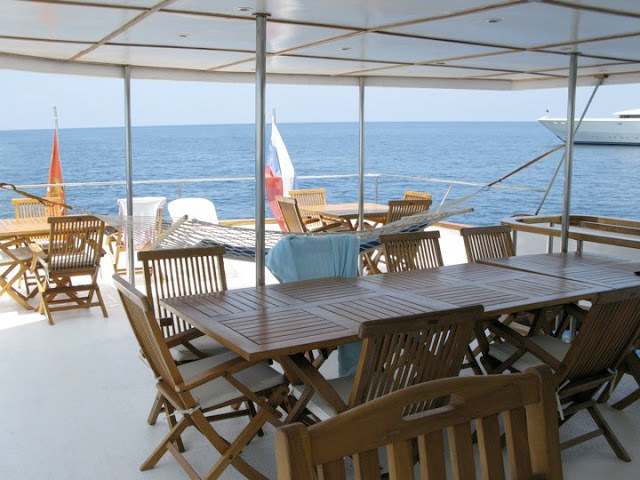 The fantastic Amphibiya is a 29 meter long liveaboard that could host 16 guests in spacious double and twin rooms in under deck cabins and upper deck suites. 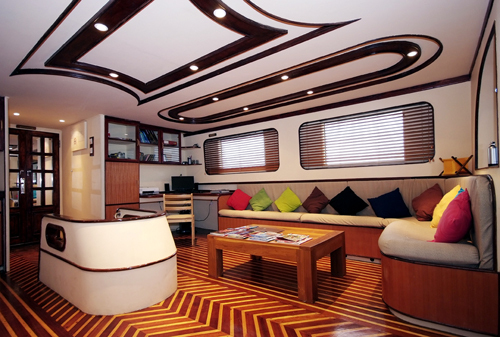 It also has a bar restaurant, a disco floor, a sun bath deck and a shadow deck on board. Amazing Surf Trip guaranteed at great prices! Maldives is the perfect trip for intermediate and advanced surfers. Its waves can't be considered super powerful, as the swell normally reaches shoulder-to-head high, but it offers big chances of barrels and long fun waves. The surfing season in the Maldives depends on the Atolls, but most of the archipelago is good for surfing from April till October, yet March and November are also good and have the best weather. Swell is amazingly consistent in this part of the planet, but even on flat days there's always something exciting to do in the Maldives, like snorkelling or fishing. 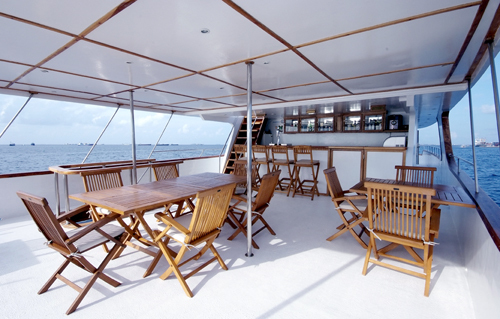 The entire archipelago can be divided into three different surf areas: Male Atolls, Central Atolls and South Atolls. The main differences between them are about swell size, consistency and most of all in crowd. There are some great surfing spots in the country, but just a few are easily accessible from resorts. The best breaks are on the outer reefs on the southeast sides of the atolls. The best way to reach them is, no doubt, by boat. Most of the spots are very close to each other, so finding good surf is easy. Some of them are nameless and yet to be found especially in Central and South Atolls. The best thing about the boat trip in the Maldives is the feeling of discovery, surfing perfect waves with no crowd in the water. Just you and your friends. Please note that you can only have this experience in Central and South Atolls. Male Atolls can be quite crowded, especially between June and August. 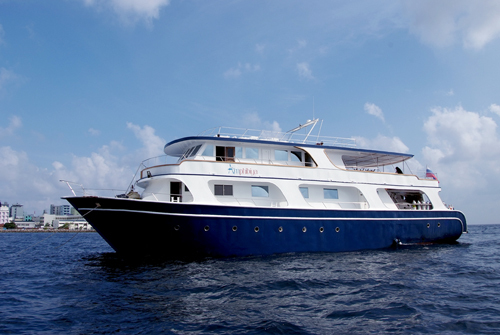 It's not exaggerating to mention that this boat is a 29 meter long floating hotel that offers dive and surf cruises to all the regions in the Maldives. 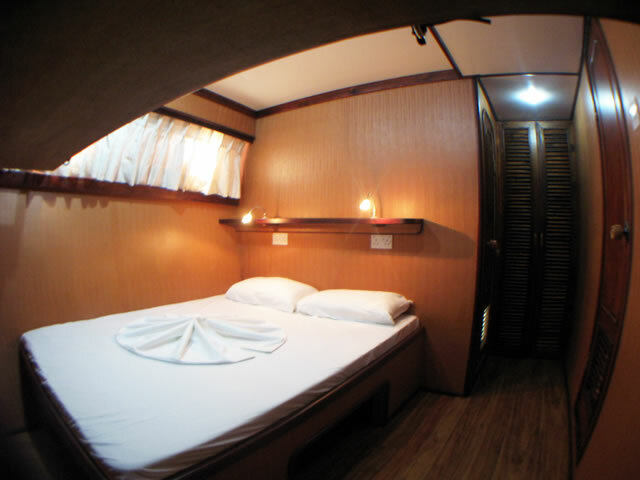 This classic liveaboard features eight standard suites consisting of double, twin and upper deck beds. 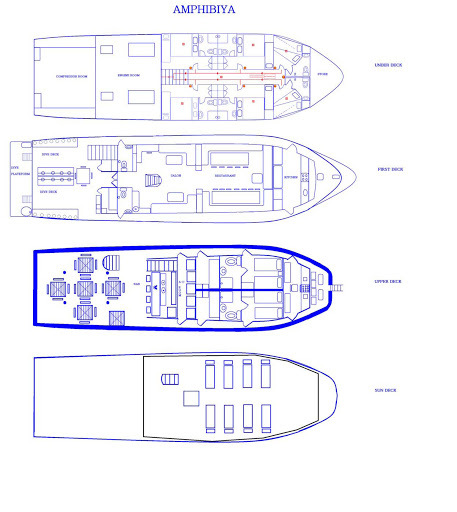 Each with individually controlled air conditioning, a wardrobe and porthole views. 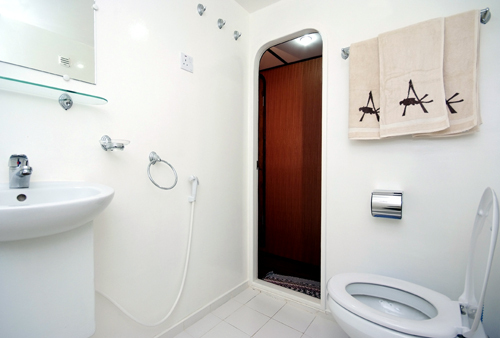 The En-suited bathrooms are equipped with hot and cold fresh water, toiletries, fresh towels, daily and bathrobes. 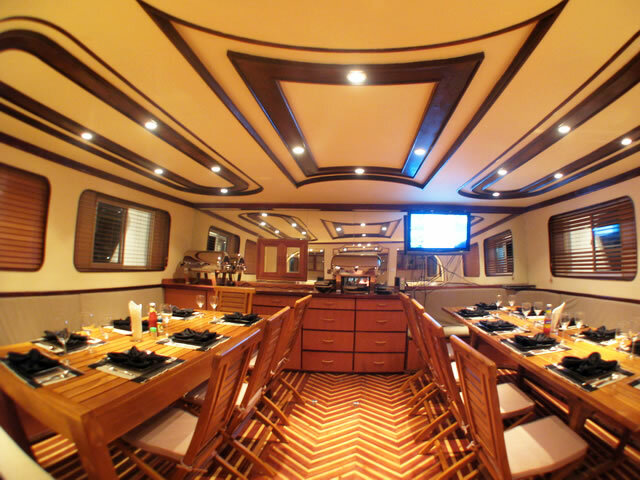 To make our surf trip exceptional, a top level chef, a friendly bartender and knowledgeable surf guides are on staff. 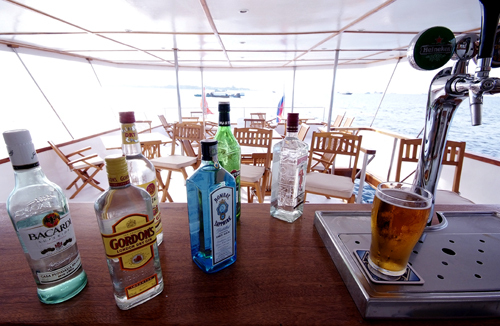 In total, a crew of eight are on hand to provide superior service to our guests. 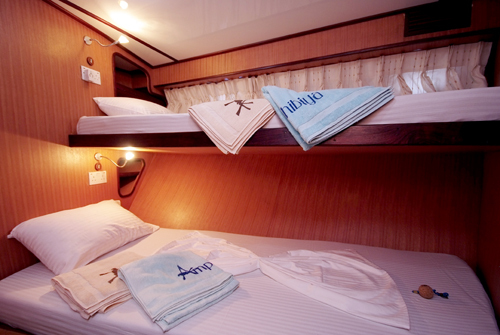 Amphibiya schedules 7 and 10 day surfing cruises throughout the year. 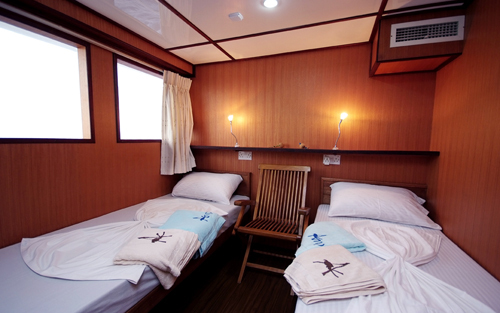 We've got experienced surfing guide always on board to assist you throughout the journey. All this at incredible prices. Excellent value for money boat! The Malé Atolls have always been popular with surfers for quite some time thanks to an easy access, great variety of spots that stay reasonably consistent, especially in the prime summer months, during generous south swells. This happens between April and October. March and November are considered transition months, but sometimes it's very surprisingly good. Winds blowing from west or southwest may be common at this time of year producing soft offshore winds. Down south in the Central and South Atolls you'll find basically the same conditions but less crowd due to its remoteness. 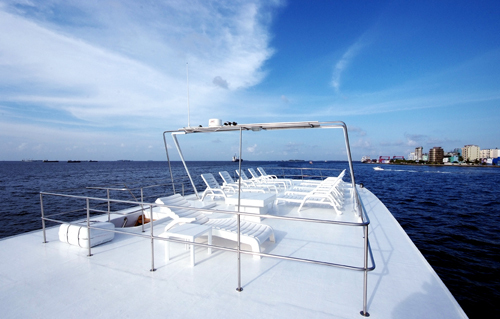 This may be an excellent choice if you already know Male Atolls and want to discover the real Maldives! 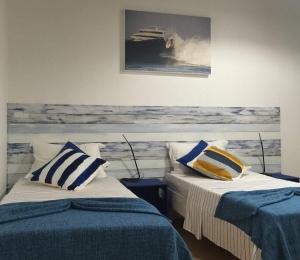 SURFINN © 24-04-2019 04:21:11. ALL RIGHTS RESERVED.